City Destroys Banner Iron Works Warehouse on Shaw Blvd. Kingshighway will close today for reconstruction of the viaduct between Shaw Blvd. & Vandeventer, but the City's Board of Public Service has already been busy spending your tax dollars to demolish a three story brick warehouse as part of an ill-conceived plan to re-align Shaw Blvd. at Kingshighway (which makes sense), but to also keep the present Shaw Blvd. (which doesn't make sense). By doing so, O'Connell's Pub loses some of its existing parking lot, so the City is demolishing the warehouse to pave additional spots to make up for the lost parking. 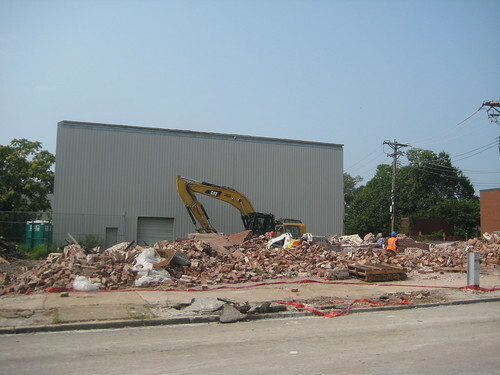 The warehouse building was in good condition and was occupied until it was purchased by the City. Next STL brought this plan to light over 3 years ago, and showed how eliminating the existing Shaw Blvd. would regain the lost parking spaces and avoid a needless demolition. 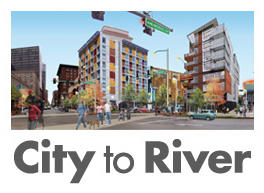 It is apparent that the City has not made any major changes and is moving forward. 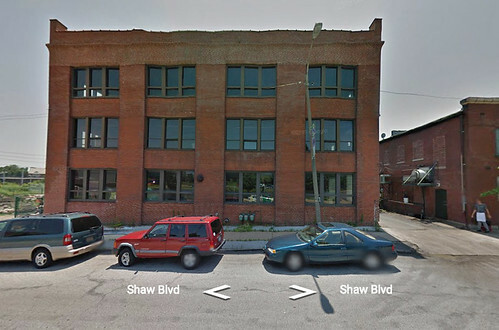 A demolition permit was issued on June 23rd and as of yesterday, the building was already gone (photo above). The plan above shows how Shaw Blvd. 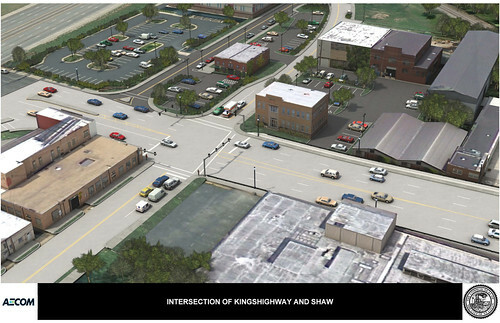 will split with two separate roadways that will intersect Kingshighway. 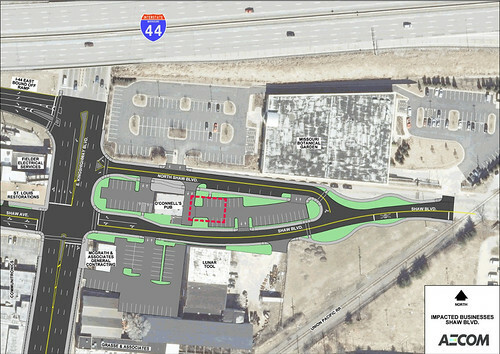 Eliminating the original roadway and adding an access drive or a short spur road providing access to the Botanical Garden lot off shaw north of O'Connell's would have provided space for additional parking spaces and would have allowed the warehouse building (outlined in red) to remain. See Next STL's plan for this here. The warehouse building had been constructed in 1911 as an expansion of the Banner Iron works complex, which had been established on Shaw on property adjacent to the rail crossing to the east in 1901. Banner Iron Works was a foundry and fabricator of cast iron and steel for the construction business, producing cast iron storefronts and other building components, manhole covers, street signal boxes as well as the iconic gas lamp poles that were installed in many areas of St. Louis. One of these poles was recently exhibited in Missouri History Museum's St. Louis 250/250 exhibit. Banner also designed and fabricated the structural frame of the Admiral river boat, which was destroyed for scrap in 2011. 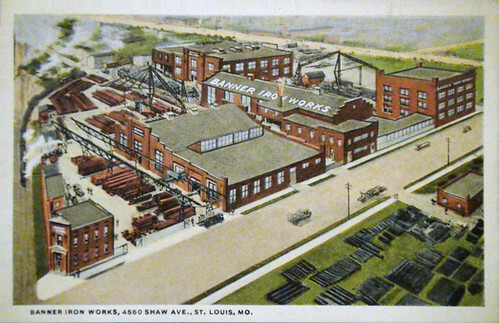 This postcard shows the entire Banner Iron Works complex with the recently demolished warehouse in the upper right corner. The company closed in 1986, and most of the complex east of the warehouse had already been demolished. The large three story building at the top center of the postcard is still in use by Lunar tool. A rendering of the flawed dual Shaw Boulevards, which not only resulted in demolition of the Banner Iron Works warehouse, but is sure to cause confusion for drivers.